Usability guidelines tend to be stable over time. 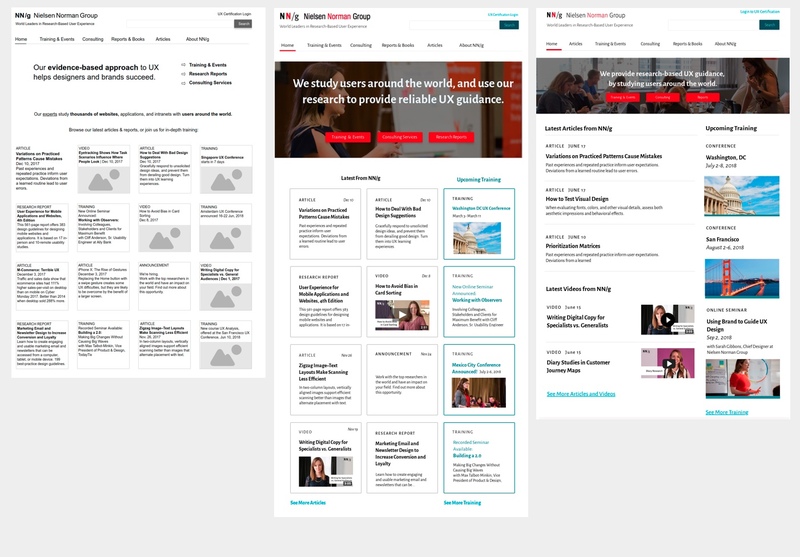 But, in the 5 years since our last major redesign of the NN/g homepage, both our content and our audience’s expectations for visual design have evolved. When we set out to redesign our own homepage, we used the same methods for strategy development, prototyping, and user testing that we teach at the UX Conference. Because even though we’ve conducted thousands of usability tests on a wide variety of websites and applications, we still find that user research and iterative design are essential to achieving the best outcomes. Since we’ve conducted many rounds of usability testing of the website in the past, we started with a good grasp of our audience and its goals. But we did conduct qualitative surveys to assess customer reactions and expectations about both the website and about our overall brand. Demonstrate credibility: The best way to explain why we are a trusted authority is to not just talk about our dedication to research, but also show prominent examples of our ongoing work. Create an appealing, minimalist aesthetic: Modernizing the visual design also enhances credibility, but only if visual details support usability rather than detracting from it. For example, large fonts are both appealing and usable; small text overlaid on images looks trendy but impedes reading. Maintain access to primary offerings: New content and visual details must not interfere with navigation pathways to services and information. We have long advocated testing design prototypes before writing code, and we followed our own advice. When it comes to prototyping, it is important to pick your tools with purpose — especially for teams like ours, where both our developers and our designers are geographically distributed. We avoided programs that were expertise-specific, which could limit or bottleneck collaboration. We chose to work in Moqups to wireframe and design, then used Basecamp to track tasks and to do lists. No tool is perfect, but these were a good fit for our team since they are low cost, easy to learn, automatically share changes to all users, and are accessible through a web browser. We started with a low-fidelity, black–and–white wireframes for content planning, but shifted to high-fidelity visual prototypes before doing any testing, since comparing visual designs to assess aesthetic appeal was a high priority. We created multiple visual versions to test, then successively narrowed the set. With each new version we added polish and fidelity. Our iterative design process evolved from black–and–white wireframes for content planning to multiple versions of high-fidelity visual mockups created with cloud-based prototyping tools. We recruited both new visitors and repeat users for 3 rounds of testing with interactive prototypes and the legacy design on a combination of both desktop and mobile devices. We began by prioritizing our content: we took a wireframe of the high-fidelity prototype and ranked the components based on importance. This became a guideline for our redesign (and served as a guideline for consistency across mobile and web). 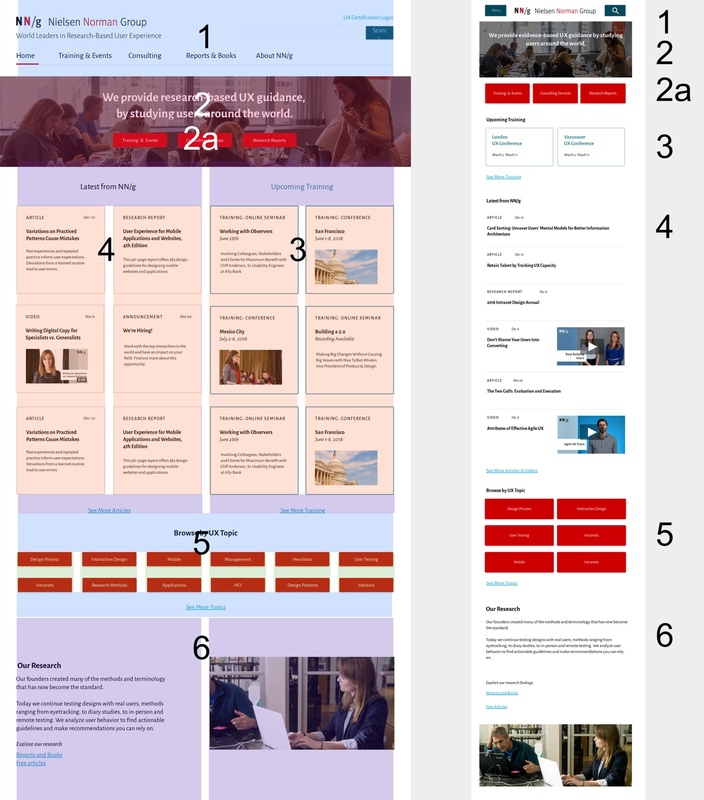 For the homepage, used the ranked components as a guide to sketch our first mobile wireframes. Starting relatively fresh for this redesign allowed us to build our layouts and visuals in a clean, sustainable manner. We created a 12-column grid (on both web and mobile) that we could use as a flexible base for a wide range of page layouts. 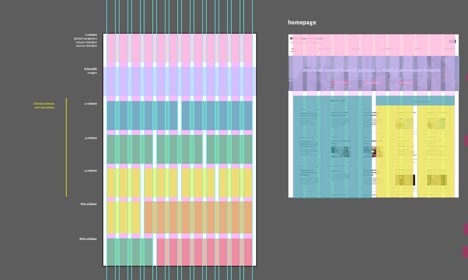 An early example of our grid system and its application to a mid-fidelity homepage wireframe. As new components were designed (for example, buttons, lines, type, hover styles, and tiles), they were added to a master component stylesheet. This process made creating specifications for developers efficient because there was no redundancy; we named each component on the page layouts, allowing development to reference the detailed spec in the master component stylesheet. If subsequent changes were made to one component in the stylesheet, these changes did not need to be reflected in new layouts. Designing in this systematic way enabled easy collaboration with our developers, who built a corresponding front-end style guide. The front-end style guide collected all product-interface elements in a modular library. It benefited us, as the UX team, in two ways: (1) prototyping ideas and implementing new designs was efficient, and (2) a consistent visual design was easily enforced throughout the product. Explore many design options without pressure to design the perfect layouts and visuals up front. Because many rounds of testing are a key part of our progress, we expected our designs to continually evolve. This benefits us in two ways: (1) we didn’t waste time making the early version pixel perfect, and (2) the time to test and iterate was built into our project timeline from the beginning. Make live improvements during usability testing to maximize user feedback. Since we are a relatively lean team, this paradigm also offered us the opportunity to divide and conquer: as one person conducted usability test, the other dynamically shifted wireframes based on feedback. Improving wireframes during the test allowed us to get significantly more feedback in a short amount of time. If we changed a design, we quickly knew whether or not it worked. This process helped us focus our design time on the layouts that had the best feedback. We are a small company, but we saw once again that a good user-centered design process doesn’t require huge budgets. Nor will many rounds of iterative design delay your project unacceptably. As long as you plan for it and use discount usability methods, you can do a lot with a little, and improve the design every step of the way. Rather than redesigning the entire site at once, we’ve opted for an incremental approach, gradually updating different pages. To maintain a basic level of consistency in the meantime, we’ve implemented a few universal styles to the legacy site as well, such as the header and footer style, as well as fonts and link colors. This incremental approach also gives us the flexibility to learn as we go. If something isn’t quite right, we can make adjustments rather than getting too far down the road, potentially tripling the re-do work. (And there are always tweaks needed after any launch: if you do enough user testing before launch, you can reduce the rework, not eliminate it.) We’re excited to share our new homepage with you, and look forward to extending these enhancements throughout our website in the coming months — stay tuned!